The American Whiskey Convention comes to the Penn Museum Friday, April 5. What are you going to do this weekend? The options are several. On Friday, you could try a lot of tipples at the American Whiskey Convention, swing to Jazz age classics at the Barnes’ First Friday, or don the glittering, feathered Mummers suits at the Mummers Museum. Come Saturday, you could recover by touring the Lower Hood Cemetery in Germantown in the company of goats, or by heading to Bucks County to see an NPR storyteller’s comedy show. And on Sunday, you could take it easy in Fairmount Park’s Shofuso Japanese House and Garden — enjoying sake or beer under the cherry blossoms — or unwind at the Met’s Unconventional Wellness Festival, where an anxiety expert, yoga, CBD, and alpacas come together under one roof. None of that appeals to you? Read on. It’s supposed to be a lovely spring weekend. Get out and do something. 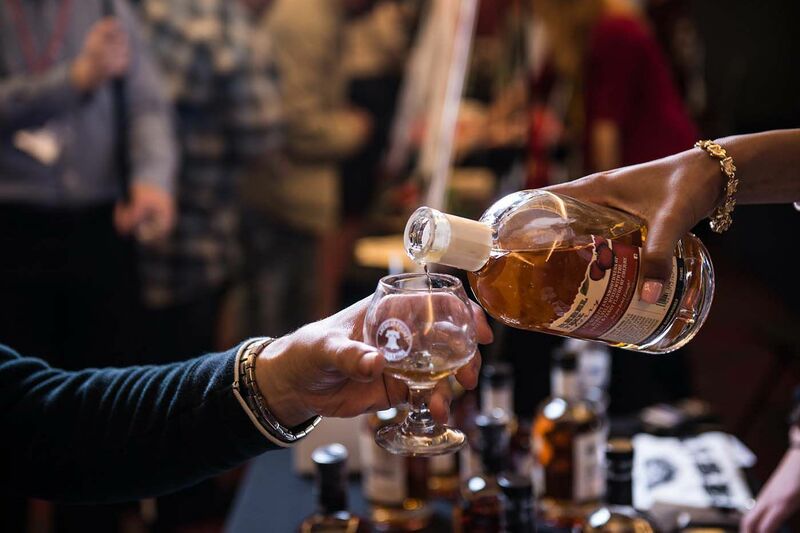 The largest all-American whiskey convention heads to Philly this Friday. Enjoy the early cherry blossoms at Shofuso's sake garden, an open-air beer and cocktail event April 6-7 and 13-14. Bring spring home with a new addition to your windowsill — pick one up at this plant market near Northern Liberties. You can also buy arts and crafts that celebrate the seasonal flora, learn about local efforts to preserve Philly’s green spaces, and peruse the plant exchange. — T.A.L. Head to the Barnes Foundation for a laid-back night of Jazz Age favorites from the likes of Louis Armstrong and Duke Ellington. The First Friday event will kick off with a half-hour of swing dance lessons, followed by an open dance floor and a professional dance showcase by the Society Hill Dance Academy. For dinner, nosh on chicken and biscuit sandwiches, cheese and charcuterie, and deviled eggs. Tickets include access to the museum’s collection and special exhibits. — G.D. Instead of simply taking in the art, the Barnes welcomes guests to cut loose on the dance floor this Friday, April 5. In celebration of Mother Earth, this lineup brings more than 50 environment-centric films to the Philadelphia Film Center. The mix of shorts and feature films will tackle issues including shark-fin harvesting, inequity in natural disasters, and the challenges that global warming poses to polar bears. Throughout the three-day festival, guests will also be invited to partake in a virtual-reality journey to northern Kenya, where the futures of wildlife and people are intertwined. — G.D.
Can you leap as far as a frog? Or see as far as an eagle? The Academy of Natural Sciences points out that many of our favorite superhero (and supervillain) characters — Batman, Catwoman, Dr. Octopus — were inspired by real animals. Come out to learn about the various superpowers the animal kingdom possesses through live animal shows, activity stations, and more. — G.D. Families can partake in live animal shows at the Academy of Natural Sciences of Drexel University as part of a special "Animal Superhero Weekend". Ophira Eisenberg, host of NPR’s Ask Me Another, heads to the Bucks County Playhouse for a night of comedic and imaginative storytelling. Her performance will zero in on the marks and scars that life experiences leave behind. Special guests and fellow acclaimed storytellers Mike Albo and Michael Murphy will join Eisenberg onstage. — G.D. Award-winning Philadelphia photographer Ada Trillo presents her newest exhibition, Chasing Freedom: Migrant Caravan Portraits, documenting the life of migrants along the U.S.-Mexico border. The series of portraits allows viewers to gaze into the eyes of South and Central American refugees who traveled in the widely publicized November 2018 caravan from Honduras to Tijuana, Mexico. Attend opening night to catch a 4 p.m. artist talk with Trillo, who will speak alongside South Philly Barbacoa’s Cristina Martinez and journalist Sam Slovick. — G.D.
Ada Trillo, a local photographer, looks up at a photograph she made that is hanging up in an exhibit at the International House Philadelphia in University City on Monday, Jan. 07, 2019. Trillo has been documenting the migrant caravan in Mexico. Wind down your weekend at the Unconventional Wellness Festival, featuring an afternoon of activities such as vinyasa yoga, a P.volve workout, and a seminar on anxiety and stress management. Curated by Yoga Hive Philly, the fest will also host vendors selling healthy foods, CBD products, and acupuncture and massage services. Show up between noon and 1 p.m. to take a picture with live, fluffy alpacas. — G.D. Explore Northwest Philly’s oldest cemetery alongside Ivy, Oliver, Bebito, Teddy, and several other bleating goats on Saturday. Philly Goat Project and Atlas Obscura are teaming up for a one-day popup at Lower Hood Cemetery, where participants can enjoy a guided tour and a visit with a herd of adorable grazers (happily tending to Germantown’s invasive plant species) all in one go. — G.D.
Goats from the Philadelphia Goat Project in the Hood Cemetery. The Beastie Boys performing at 2007's Live Earth concert at Wembley Stadium. Ad-Rock and Mike D come to the Tower Theatre Friday, April 5, 2019 for Beastie Boys Story. The big-bearded and burly-voiced country-rebel archetype currently embodied by Chris Stapleton and the Brothers Osborne (as well as more cleanly shaved Sturgill Simpson) has an antecedent in Jamey Johnson. The Alabama singer-guitarist has been oddly quiet as a recording artists in recent years but remains a force onstage. He’s on the road with a 10-piece band (including a horn section), and while he’s a formidable songwriter whose songs have been covered by George Strait and others, his recent set lists have been peppered with covers of old-school country acts like Merle Haggard and David Allan Coe. Neotrad singer Kelsey Waldon, the pride of Monkey’s Eyebrow, Kentucky, is the opener. — D.D. Muse comes to the Wells Fargo Center Sunday, April 7. If any trio was built to make dramatic, arena-scaled music, it is Muse. The Brit synth-rock unit — whose gihugic crooning, moodiness, and all-around bigness make Depeche Mode seem minuscule — started life with the pomp and circumstantial Showbiz in 1999. In 20 years, Matt Bellamy has become a king of romantic melancholy, but not without a sense of humor, as shown on Muse’s most recent album, Simulation Theory. — A.D.A. Billed as Nick Lowe’s Quality Rock & Roll Revue starring Los Straitjackets, this tour will be a belated 70th birthday party for Lowe, the former Rock pile coleader and Elvis Costello producer who entered his eighth decade in March. As white-haired, quick-witted, astute, and understated gentlemen rock-and-rollers go, Lowe has no peer. His four-song Love Starvation EP (coming out May 17), made with the Lucha Libre wrestling mask-wearing Straitjackets, offers evidence that Lowe remains in top form, from the clever title cut to a choice cover of the Sammy Turner’s Phil Spector-produced 1960 hit “Raincoat in the River.” — D.D.